Don't they just fly by, the weeks? Photographically speaking, this was a rather dull week really. Largely because I had my head down, working so much. But I shall do my best to make it visually stimulating. It started to really cool down this week. And it rained, how it rained. And then it rained. Billie doesn't much like the rain (though she does love hoses and pools - weird, huh?). I'll have you know I did not buy her this raincoat, it's courtesy of Him Indoors. This is the sensible one - the other one (which I have buried in the back of some closet) has pink polka dots on it. I mean... really. I spent a lot of time sweating over paperwork, trying to get all of our stock managment rationalised. Boring but necessary work, which involved going to our lock-up one day to take pictures of boxes. Thrilling. Somehow, I managed to go out one evening. A rare occurrence these days, I assure you. I heated up my Oyster card and took the bus all the way into Stoke Newington (less than a mile, dear readers) to go to dinner with my mate Julie, who I haven't seen in yonks. We went to the Three Crowns pub and had a delicious meal and some lovely wine. I was so busy catching up that I forgot to take any pictures of the food! It was great to see Julie and our waitress was a total sweetheart. 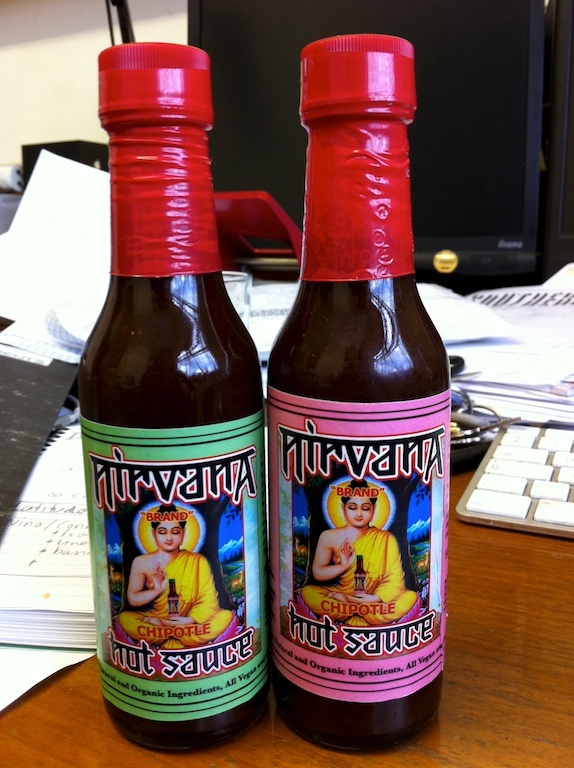 My friend Eric from Philly makes his own small batch hot sauce, Nirvana, which he packages in these nifty little bottles. Aren't they cool? And the sauce.... oh my, the sauce. It's so good. I haven't tried this batch yet, I'm saving it for something worthy. I've told him he has to get that shizzle up on Etsy, sharpish! Tuesday was my father's 70th birthday. I hate being so far away on special occasions like that, but I called him and we talked until I could tell I was boring him (or he needed to get a cold beer) and it was great. This is photo of the two of us when I was about one. I love this photo and some of the other family ones that I have coerced from my mom and grandmom. HAPPY BIRTHDAY POP! (I told him he needs to read my blog more, so this is a test).